Last month former Cambridge Analytica (CA) employee and “whistle-blower” Christopher Wylie addressed the Business of Fashion conference and provided some insights into the strange role which fashion played in their political targeting in the 2016 US election. This also turned up an interesting reading of the relationship between culture, personality and aesthetics in an era of social media and digital politics. Wylie described how CA “weaponised” the fashion industry as they used data from (mostly) Facebook to target users with pro-Trump messages. He said that music and fashion are the most powerful predictors of personality traits. A predilection for “American heritage brands” such as Wrangler and LL Bean meant people were more likely to be receptive to pro-Trump messaging than someone with a liking for Nike or Loius Vuitton. Wylie opined that the fashion industry has long been creating cultural narratives which CA exploited for their targeting. So, when looking to find people susceptible to alt-right, nationalist and populist messaging they simply had to pick up “off the shelf” narratives which had been built up through advertising and branding in the fashion (and other industries) for decades. Facebook provided a way to connect these narratives to individual users through the affinities and personal connections established through “liking” and other forms of engagement on their platform. The fashion industry was the biggest target of his critique partly because he was speaking at a fashion business conference but also because, he suggested, they are intensely engaged in the development of aesthetics and in attaching people to these. And as Wylie stated “When we think about fascist movements, the first thing they do is develop an aesthetic“. This perhaps helps us to understand further Donald Trump’s seemingly meteoric and insurgent political success and the role which social media played in this. It seems to be clear that the potential for the viral spreading of untruths and disinformation was significant in the election. However, the social media advertising infrastructure provided his campaign with knowledge of affective and aesthetic relations between personality traits, brands and political persuasions. This reminded me of Adam Arvidsson’s description of Facebook as “a machine for the reassembling of the social into brand-like micro-publics without the need for human ‘creative’ intervention” (Arvidsson, 2016: 12). 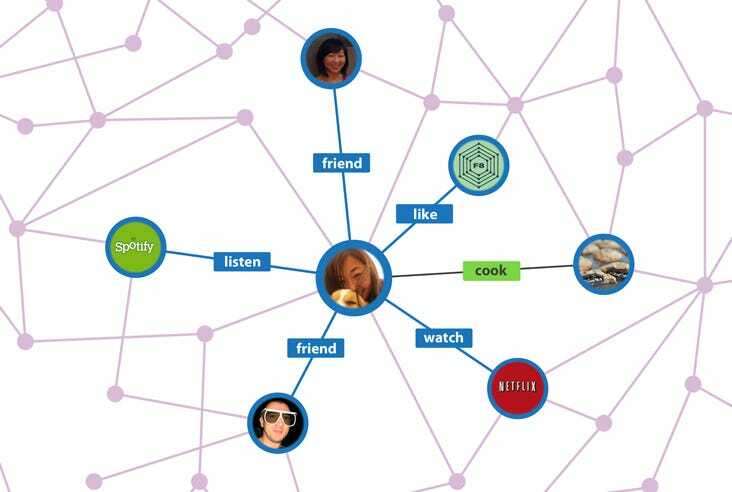 The platform constructs a “virtual reality” referred to as the “social graph” in which “users'” interactions with one another and with “objects” (pages, videos, groups, etc.) are represented as “edges”. Which we could see as looking something like the image below (this is a good explanation from Business Insider). By mapping peoples’ affective relationships with other people and with ideas, cultural products, places and brands a detailed picture of not just their personalities can be built but also their emotional relationship with definable aspects of the social world. Moreover, people can be broken down into constituent parts in the form of psychographic profiles (see mine here). It is this granular data which enables Facebook to construct “lookalike” audiences so brands (or political campaigns) can target individuals or groups who are similar others in quite specific and detailed ways. This tool was credited by Trump’s campaign manager as being one of the most powerful tools in spreading pro-Trump messages to those most likely to be receptive to them. Trump’s swift ascendancy to the top of politics can be seen as a particularly 21st century triumph of branding. Despite his boasts of being a great “builder” since the 1980s his only success (outside of TV) has been in selling his brand to other builders (as well as universities, steaks and anything else which will have it). His campaign successfully mobilised the virtual “brand-like micro-publics” constructed by Facebook to target people who were “conventional”, low on “openness” and liked an unfashionable brand of jeans. Arvidsson A (2016) Facebook and Finance: On the Social Logic of the Derivative. Theory, Culture & Society 33(6): 3–23.